A week or so ago we hosted a 15 minute Pretend Play Challenge and did a pretend play activity every day all week long! It was a blast! One thing I realized is that I hate pretend play activities that require a lot of set up. Today I'm going to share how we set up our Pretend Play Library with only a few simple props. It was a huge hit! Kids love to play pretend and often want me to join in. This pretend play library set up was probably my favorite one we did all week because it required very little materials and involved some relaxation! We set up a table with a few favorite books on it and a cash register. My oldest was the librarian and made little paper to give to each person when they checked out a book that were little receipts. We set up kid sized camping chairs and adult sized camping chairs on our patio and we placed baskets of books around the patio. The kids could sit anywhere they wanted and had free choice reading time to start the play time! We also set up a blanket on the lawn for the part of library time when the librarian reads a book to the children! My son was so excited to read to his little siblings and I loved how he showed them the pictures on each page! It was funny to see him get a litle frustrated when the little kids wouldn't raise their hands to ask questions, but called out instead. The kids were outside playing for at least 45 minutes. Sometimes they would come sit by me in their camping chairs and I would read stories to them. Sometimes they would look at books all by themselves, and sometimes they would go up and see the librarian and "check out" a book! This pretend play activity was so relaxing and I loved exploring books while we were outside enjoying the beautiful weather too! Pretend play is awesome because it helps kids work on communication skills, develop their vocabulary, practice turn taking, work on social skills, and nurture their imaginations! 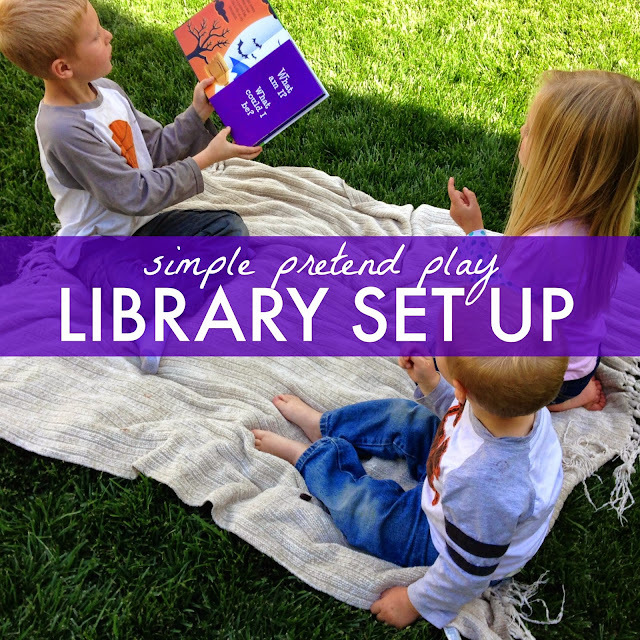 Do you have a favorite pretend play activity that has very little set up? I would love to hear about it!! 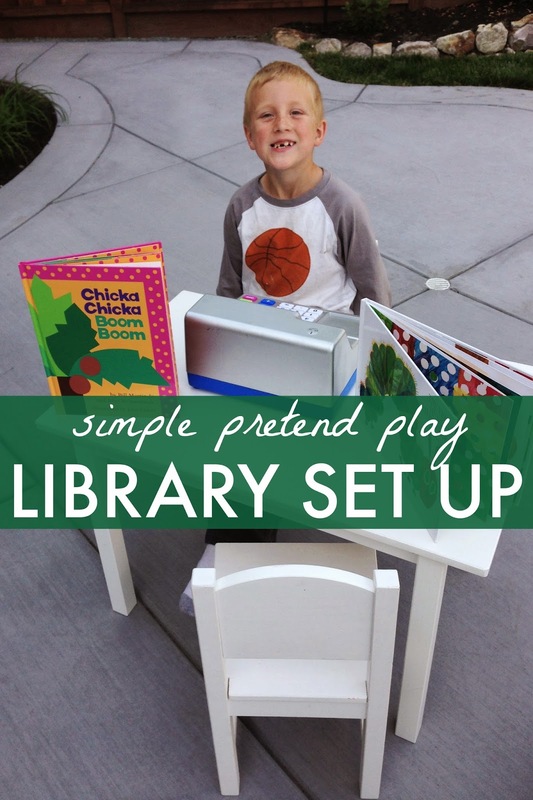 You can find more of my favorite ideas over on our pretend play ideas pinterest board. I love your face book page. It has a lot of well rounded ideas I share on my own page, Sustainable Education Solutions/Spokane-south.